Over the course of the weekend I took time to reflect a bit about various holiday traditions that I have. I tend to have a pretty improvisational approach to life, and over the recent years I have developed a bit of an anti-rut mindset. I do not gather or hold traditions simple for the sake of tradition. If something feeds my spirit, makes me especially happy or some such, then it is something I am likely to keep. If it is tedious or pointless or gives me a headache, then it is likely to be discarded. 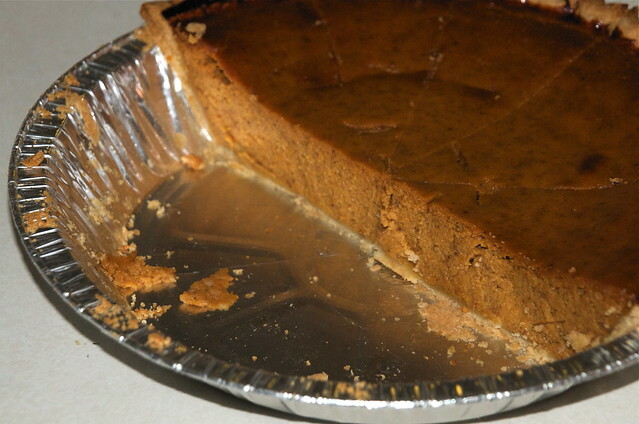 Pumpkin pie at Thanksgiving is a tradition I intend to keep. I don't make them during the year very often. I might make one at the winter solstice, but other than that, pretty seldom. This year we were gathering with Reena's mother and brother and his wife, and our friend H. was a new-to-town orphan so she joined us as well. I was on the hook to bring pie, so I made a couple of pumpkin pies from scratch. I reduced the sugar and increased the ginger because that is my preference. Turned out pretty tasty if I do say so myself. Reena's family now has a holiday tradition of getting the entire family together between Thanksgiving and Christmas for one, big event. We used to rent a house or block of rooms somewhere and make a long weekend out of it, but as my Mother-in-Law becomes less able, we shorten it down and make it closer to her home, or now, at her home. Since Christmas is therefore celebrated early, it means that the weekend of Thanksgiving becomes the time to take down the fall decorations and get the winter holiday stuff out. 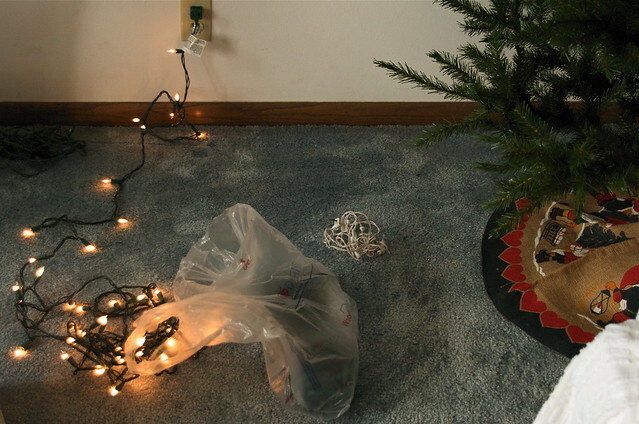 Which starts with making sure the strings of lights still work. So immediately after finishing dining on a traditional Thanksgiving dinner (including that awful canned cranberry abomination) we set about making the house ready for Christmas. For simplicity she now uses an artificial tree, and in short order it was set up, fluffed, positioned, be-lighted, and decorated. It is all ready for Santa Claus to show up a couple of weeks early by special invitation. Among the things I am most thankful for is a family-in-law that is so great. They like each other, behave well, are reasonable even in their differences, and they make me feel welcome. Really, what more could a son/brother-in-law ask for?